Debate over a bill designed to find common ground on the contentious issue of abortion turned divisive at the Capitol on Thursday. The bill would provide $2 million a year in state grants to nonprofit agencies that promote alternatives to abortion. The bill has broad support, but the debate in a key House committee ended up dividing along traditional lines of abortion politics. St. Paul, Minn. — The anti-abortion group Minnesota Citizens Concerned for Life says its "Positive Alternatives Act" is its top legislative priority this session. The bill would for the first time provide state grants to adoption agencies and other organizations that promote alternatives to abortion. MCCL lobbyist Andrea Rau says many women get abortions because they need financial help or counseling. She told members of the House Health Policy and Finance Committee that data compiled by the state health department found that about 18 percent of the women who had abortions in 2003 cited economic reasons. "An unplanned pregnancy may be a detour on the road of life, but it is our responsibility, all of us, to help each other in our times of need," she said. The bill would allow nonprofit agencies to use the state money to help women with medical care, housing, child care and other services. Agencies that encourage women to carry their pregnancies to term would be eligible for the state grants. Organizations that provide abortions or mention abortion when counseling pregnant women would not. Tina Smith of Planned Parenthood, the state's largest provider of family planning services, opposes the bill. She says taxpayer money shouldn't go to groups that don't tell pregnant women about all of their legal options. "And when any of us seeks medical care, we expect all of the facts, not just some of them. This is the standard of care that is available every day in health care clinics and doctors' offices across Minnesota, including in Minnesota's 22 family planning clinics," according to Smith. 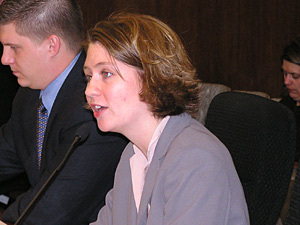 Another opponent of the bill, Julie Seminitis of Sartell, told lawmakers that she researched a project for her master's degree on crisis pregnancy centers in the St. Cloud area. Seminitis says she found that centers that promoted adoption gave women misleading information. "Some crisis pregnancy center volunteer counselors make big promises in order to convince a woman to choose to parent. For example, 'luckily, there's plenty of state aid available. Food shelves, good Samaritans that are always willing to help and friends to babysit - everyone loves babies. And you can easily get daycare assistance from the state,'" she said. Supporters of the legislation say the bill doesn't take money away from organizations that provide abortions; it simply provides new money for alternatives. The debate then shifted from a discussion about adoption to one of abortion. Republicans on the committee grilled Planned Parenthood's Smith about her organization's funding, its mission and how it counsels pregnant women. Republican Tim Wilkin of Eagan asked Smith why Planned Parenthood clinics nationally performed more than 247,000 abortions in 2002, yet referred fewer than 2,000 women to adoption services. "Why is your organization so utterly ineffective at referring for adoption, and here you're trying to get us to give you a piece of the action here for alternatives?" Wilkin asked. "We are here today in order today to urge the committee to dedicate taxpayer funding to programs that provide women with a full piece of information about all of their options," Smith said. Smith says Planned Parenthood wouldn't qualify for the proposed state grants. She says her organization does receive 6 percent of its funding from the state through family planning grants. She says she was disappointed by the tone of the questioning, and hopes it doesn't lead to battles over family planning money this session. The bill's sponsor, Republican Brad Finstad of New Ulm, says he too was surprised by the committee debate. "With 75 co-authors, I didn't expect the politics to be played. But it's surprising in the last week how it became more of a pro-life, pro-choice issue, and more political. So I'm a little disappointed and I'll work to try to bridge the gaps and bring people together," Finstad said. Finstad says the bill has 35 authors in the Senate, enough to pass the bill if it reaches the floor. It has a hearing in the Senate Health and Family Security Committee next week, where a majority of committee members support legalized abortion. The House committee approved the bill by a vote of 11-to-5.